Downloaded some pictures from my phone this weekend and discovered a couple of pictures I took August 7, 2009. A little background. As mentioned in an earlier post, I first fell in love with the Nordhavn line when an article about the NAR and a great picture of a N62 crossed my desk. I spent a few years touring the various Nordhavn regional sales offices but my timing was awful, saw a lot of other models but no N62. 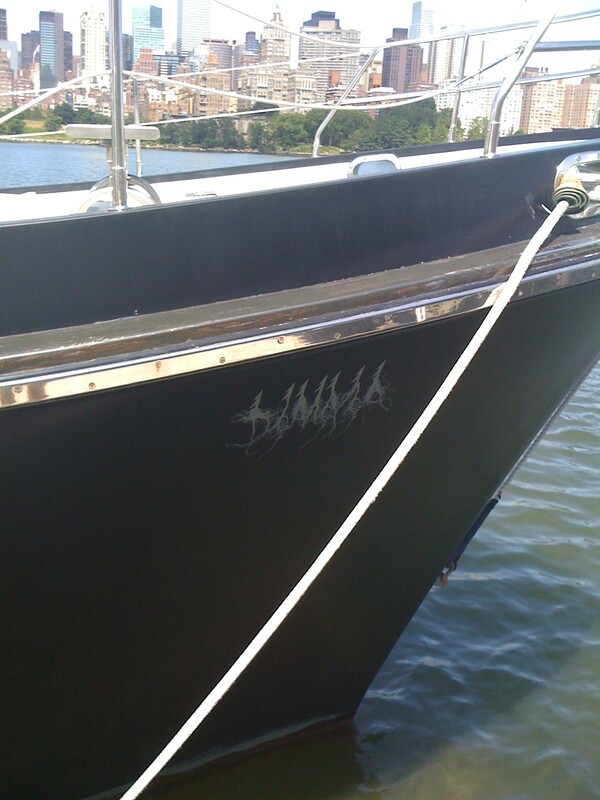 Then one day Andy called with the news that Dimma, a N62 was for sale and was, at that time, docked on the east river across from Manhattan. Great timing, as I’d just recently moved my office from Manhattan to central North Carolina. Those that follow the Nordhavn line know pretty well the history of N6209. Originally commissioned by Prince Rainier who walked away from the deal, the boat was purchased by Ken and Roberta Williams, named Sans Souci, had a stern bustle (originally built for Jimmy Buffet) installed and then sold to Bjork and Mathew Barney. To prepare for the trip I sent an email to Ken asking for his reflections on N6209. Within a few minutes I received a simple response, “Call me” and his phone number. 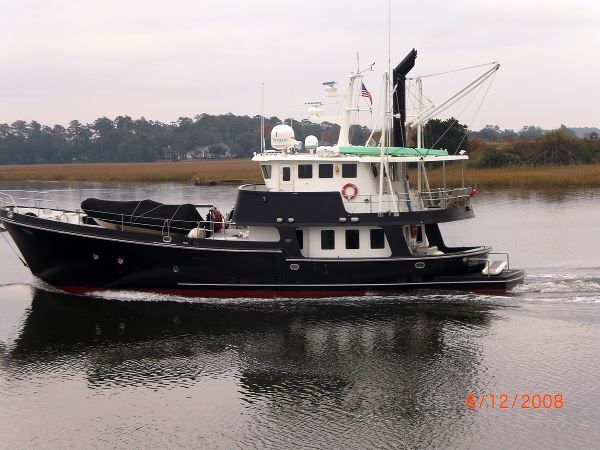 We spent over an hour reviewing his experiences, what he liked, what he did to the boat and what he would have done if he had not upgraded to a larger Nordhavn. So on Friday, 8/7/2009 a friend and I headed to New York to check out N6209. The first thing that strikes you is the boat is, well, black! Really black. 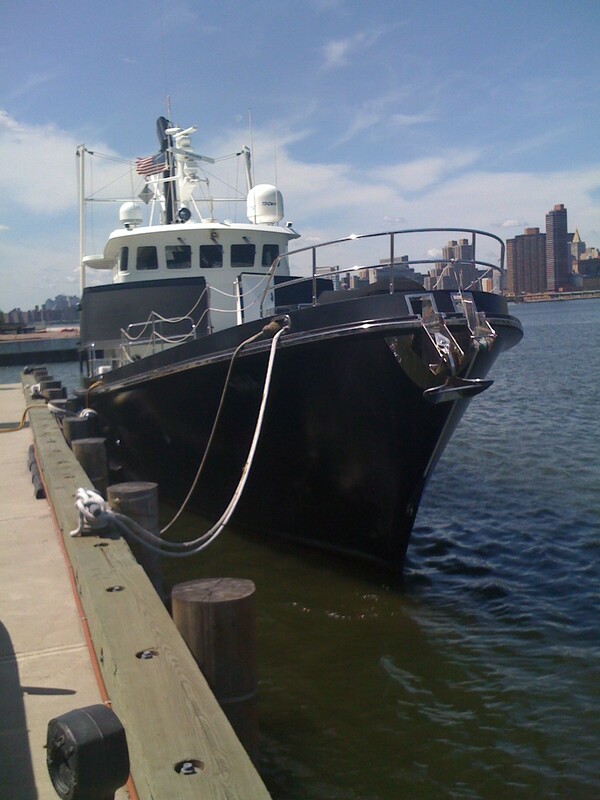 The hull is black, the trim is black, the davit is black. It is really black. Started thinking about how hot that boat was going to be sitting the sunny Caribbean of my dreams. And another picture of the boat from the first angle we saw it. The fun did not stop there. The wood in the salon walls, which looked white in pictures the listing broker sent turned out to actually be a very light green. But the owners cabin was as described, an interesting shade of fuchsia. Clearly I was in over my artistic head. We finished our review of the main level, and headed up to the pilot house, were the rear portion had been ripped out to make way for a recording studio. We talked to the young Australian Captain who was in charge of the boat for about an hour, got a list of his likes and dislikes, recent work on the boat and learned that he hated the tidal flows in the east river. My buddy and I retreated to a local bar and contemplated the amount of work needed to “normalize” N6209. In the end I decided it was a bigger project than I was prepared to sign up for and, for the first time, became to consider how I felt about the lack of a flybridge on the 62. Dimma did find a new home and is apparently still proudly wearing her unique color palette.